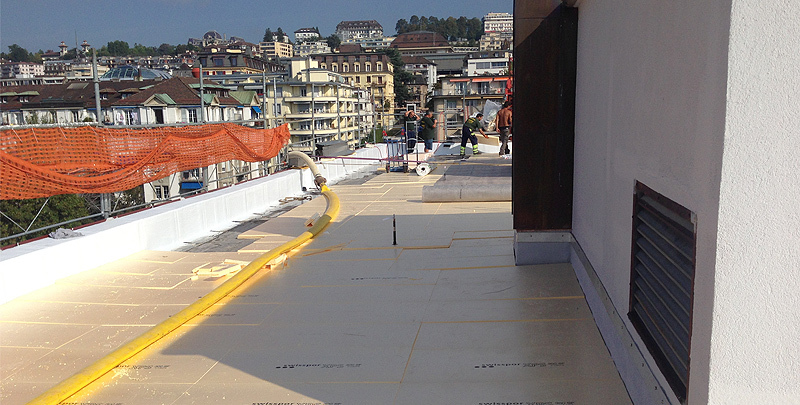 Recognized specialists in waterproofing and the all-round performance of flat roofs. We have chosen the Red Kite as our company emblem in order to portray and represent our dynamism. With this logo we wish to illustrate our agility and the perfection of our services. We also aim to express our view from above, encompassing the whole field of flat roofs. Waterproofing with high performance bituminous membranes. Refurbishment and waterproofing of buildings. Application of thermal insulating materials. Development and installation of green roofs. Our expertise, particularly the “Long Life Duo roof” with decades of certifications, makes medana étanchéité sa an effective partner. 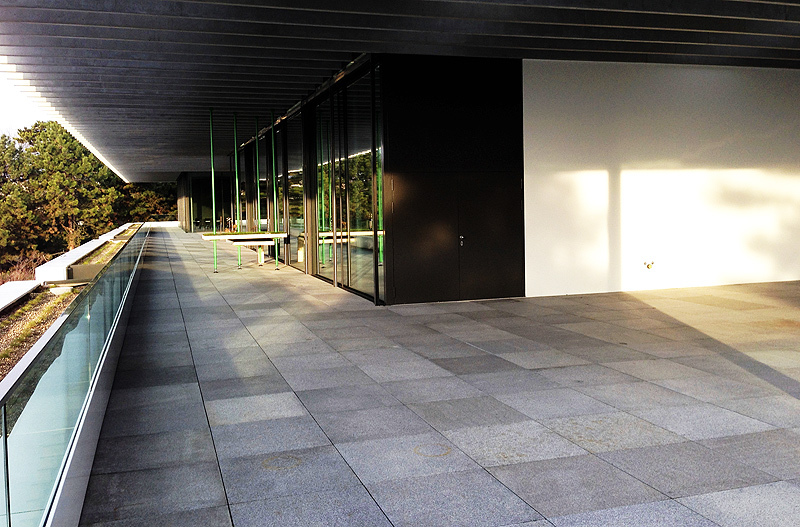 On this site we will show you the various flat roof designs and examples of installations. Please choose the technical solution most suited to your waterproofing issue from the menu, be it a roof, a terrace or any other building feature or civil engineering work. 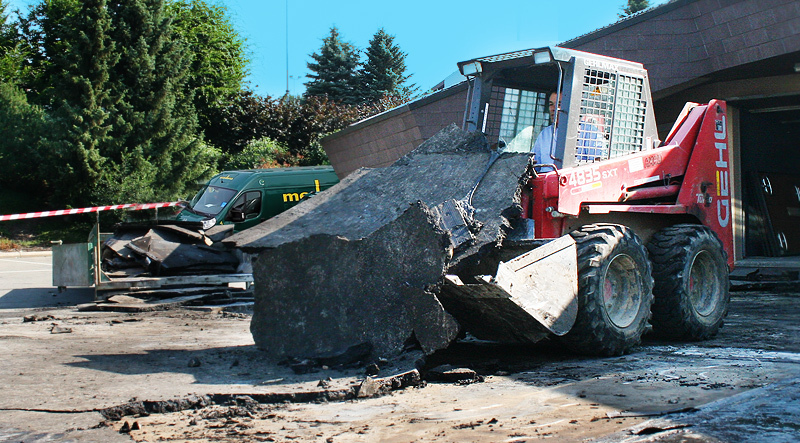 Short waterproofing descriptions and details are presented for indicative purposes only and only those concerning bitumen are included. We recommend that you consult either us or the various manufacturers about the technology and installation of synthetic material sheets. medana étanchéité sa is a high performance company, both in the preparation and carrying out of commissions in the field of flat roof coverings and in civil engineering. The company was founded in March 1984 by the current director, Mr Silvio Medana. The company works in the canton of Vaud and the nearby cantons, and sometimes as far away as Ticino. 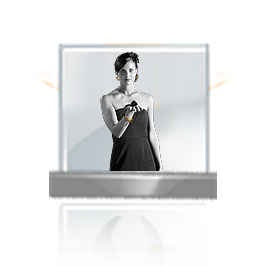 The company has around thirty satisfied employees who work with great precision in a friendly, welcoming environment. Since the company gives great importance to education, is strongly involved in professional training and wishes to pass on its knowledge, it trains apprentices every year. A company that is deeply rooted in tradition and at the same time closely follows the latest innovations, it works in close collaboration with Swiss and European manufacturers. The philosophy “Our profession: Waterproofing – Our mission: Quality – Our passion: Beauty” underlines its wish to create attractive roof surfaces on homes which are constructed with all its skills. 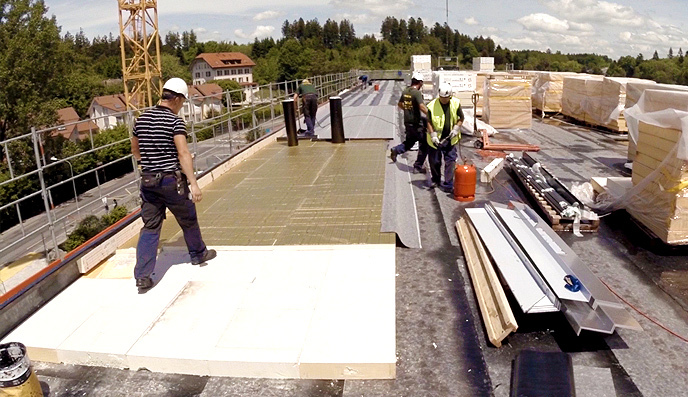 A roof with waterproofing that is applied directly on the thermal insulation, without an intermediary air layer. The roof support is protected from big changes in temperature by the insulating material and is therefore not subject to small-scale thermal shocks. On the other hand, the waterproof membranes are directly subject to the effects of the climate (temperature changes, the UV rays of the sun, etc …). We protect against these climatic effects by placing ballast (strong protection such as gravel, slabs, etc …) onto the waterproofing material. Type of roof in which thermal insulation is placed above the waterproofing material. This insulation consists of impermeable materials in the shape of stiff foam panels of extruded polystyrene and is covered with a protective layer or practicable coating. The inverted roof is a practical system both from a technical viewpoint and regarding the physical construction. Roofing support and waterproofing are protected from thermal actions and UV rays by insulating material and ballast. The ballast must be able to prevent the insulating material from being detached or lifted by the wind. A type of warm roof in which all the layers, apart from the protective layer or practicable coating, are connected to the whole surface between them and the support. This system, renowned for its remarkable longevity, is “compact” because the insulation sections (generally with cellular glass) are attached to the support directly with hot bitumen. Joints are also filled with bitumen and the waterproof bituminous membranes are then glued and fully bonded to the insulating layer. The compact roof is ideal for zones at risk or under great stress, for example public terraces, green roofs or parking roofs. A warm roof system on which a second insulation layer is placed, consisting of foam panels of extruded polystyrene, following the principle of the inverted roof. 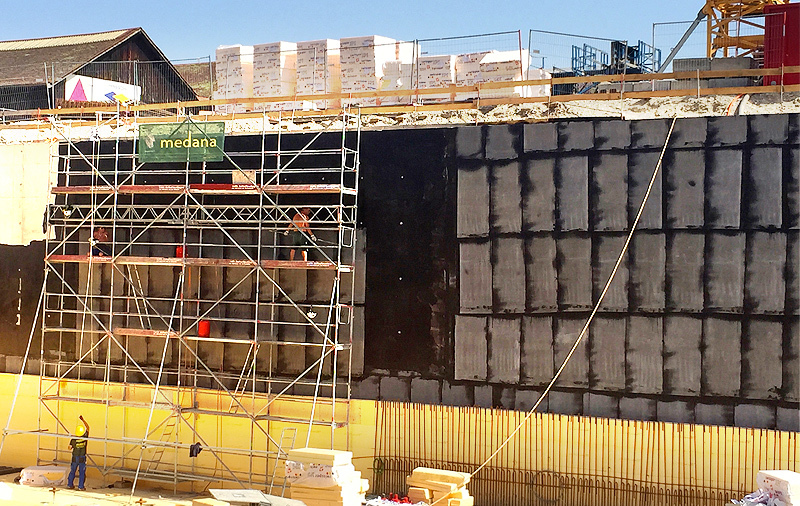 This system helps to improve thermal insulation and inertia, whilst at the same time ensuring better mechanical and thermal protection of the waterproofing material. Durability of 50 years can be expected with the ‘Long Life’ design, in which particular care is given to certain points and all the surfaces of the waterproof membrane are protected, both horizontally and vertically. An easy process to implement because the plants only use a small amount of soil (a substrate with a composition that is essentially mineral-based and a thickness of between 6 and 10 centimetres). Naturally, these are species that have little need for water, care and nutrients. They normally grow in arid and uncultivated places and do not need to be pruned or mown. This is a form of vegetation that is mainly horticultural. It is a multi-functional garden with a lawn and perennials, shrubs and bushes with various uses. It requires a great deal of attention, implementation and care regarding cultivation and upkeep. These roofs have an important ecological impact: they contribute to the well-being of residents and allow wildlife to find habitats where natural equilibrium is restored. A practicable roof with a waterproofing system which has been specifically designed to be combined with heavy protection such as asphalt concrete or paving. 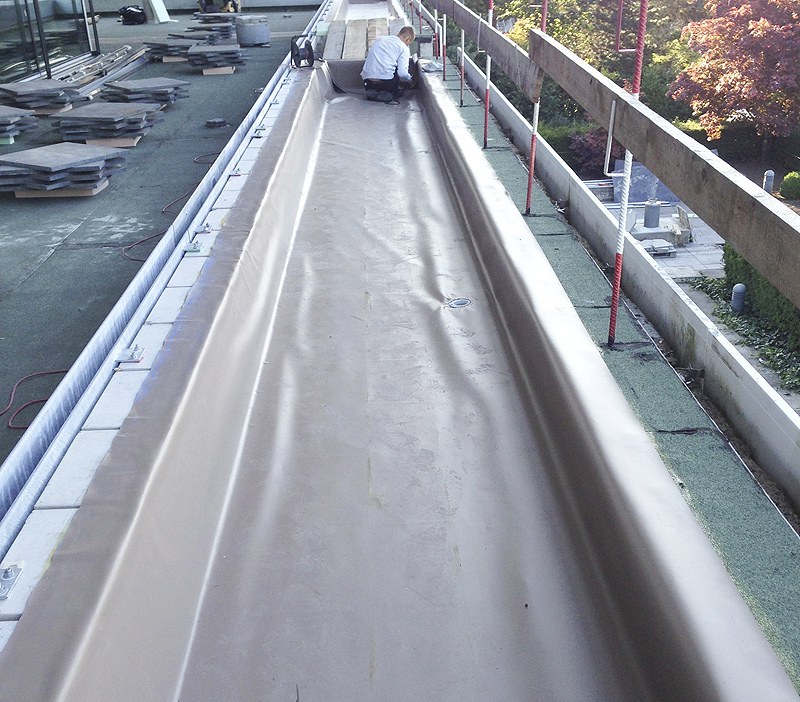 In certain cases, thermal insulation can be incorporated into the waterproofing system. However, the choice of insulating material and precautions for installation are important points to check. Implementation liquid synthetic resins is simple and provides a complementary solution to the execution of waterproofing. They directly apply by brush or roller and harden by chemical crosslinking. Some applications are strengthened by reinforcement nonwoven. These resins allow the sealing surfaces and roofs reliably for long lasting protection. In addition, they can be combined with most seal materials in sheet. Part of the roof is accessible to the public or private individuals for full usage as a place of relaxation and for meeting others. There are many ways to carry this out, with various techniques and processes. Our company has created many terraces and balconies. See the non-exhaustive list of these works. Necessary material and operations to cover a pit to protect an underground construction against water infiltration. The different layers of the waterproofing form a comprehensive device for an efficient tubbing. From the beginning of the study, it is neccessary to forsee the necessary means in order to achieve a flawless waterproofing. The construction management warrants that all terms are observed and enforce all necessary precautions to avoid any damage to the waterproofing. Waterproofing membranes in monolayer plastic strips of PVC, polyolefin or rubber are also used for the construction of flat roofs and terraces. The specific laying techniques demand a rigorous implementation. In order to answer efficiently to the interest for a waterproofing with a monolayer plastic strips, we recommend you to contact us or to consult different providers cited in our links. “Tired” Roof (20+ years) with a waterproof layer in bituminous multi-layers. The possibility of recovery with a waterproof bituminous membrane on all surfaces while still retaining the existing elements. And better still, the possibility of starting work on a more complex renovation such as a double or improved roof. A defective roof in which the insulating material is damp or dirty, etc. or a roof at the end of its life (30+ years): Total repair of this kind of roof. For this type of operation, any roofing system may be considered (see the chapter for the types of roof). The flat roofs that protect a large number of contemporary properties must be absolutely waterproof. And yet so little is read and understood about this issue. It seems clear that if certain roofs have had several problems due to defects in technical design or work carried out by unqualified people, defects in the upkeep of these fundamental works must be one of the main reasons for any problems. This is why, in order to ensure and increase the longevity of the overall waterproofing of flat roofs, it is imperative to carry out regular checkups. 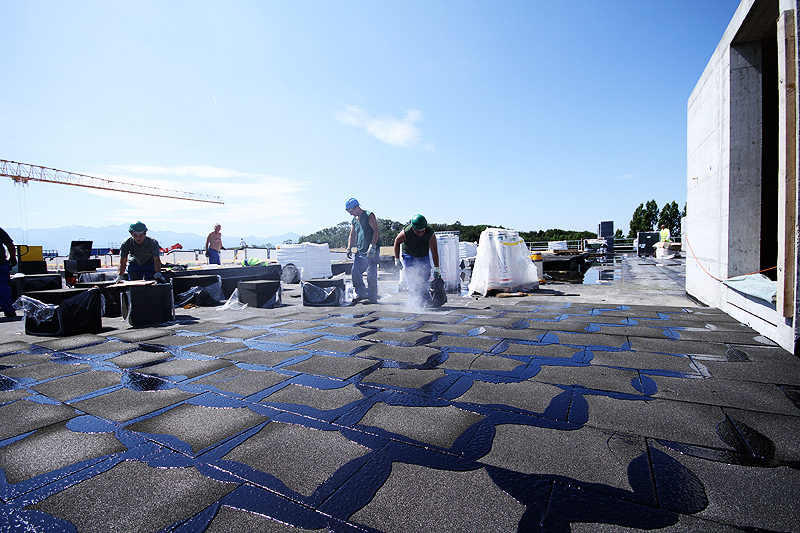 medana étanchéité sais a well-known company in the field of top-of-the-range waterproofing materials and is aware of its responsibility for the reputation of flat roofs. It offers a complete service with a maintenance contract to meet the needs of the different types of flat roofs. These maintenance and upkeep contracts, involving one or more annual visits, allow master builders to benefit from an extended guarantee. Launch of the new version (v.4.1) of the website, touch-optimized for tablets and smartphones. Partnership with the Energy Advisor Study L. Vuillemier. Restructuring of our accounting department and Trust. New version of our internet site. Enjoy your visit ! [(v.2.1)] . Move to our new offices in Ecublens. Launch of the internet site www.medana.ch [(v.1.1)]. The photovoltaics effect (PV) refers to the ability which possess the semiconductor materials, to directly convert to various components of sunlight (not the heat) into electricity. It is the only existing alternative which generates the production of electricity from mechanical force. PDF: Photovoltaic, What is it? For some buildings, where roof visits are frequent, a freestanding security system with a continuous fence is the best solution.